S T O R Y As a Milwaukee native, I've always loved the beautiful art deco Wisconsin Gas building in downtown Milwaukee, and especially rhyme that helps you tell what the weather flame is telling you...as the saying goes, When the flame is red, it's warm weather ahead! When the flame is gold, watch out for cold! When the flame is blue, there's no change in view! When there's a flickering flame, expect snow or rain! 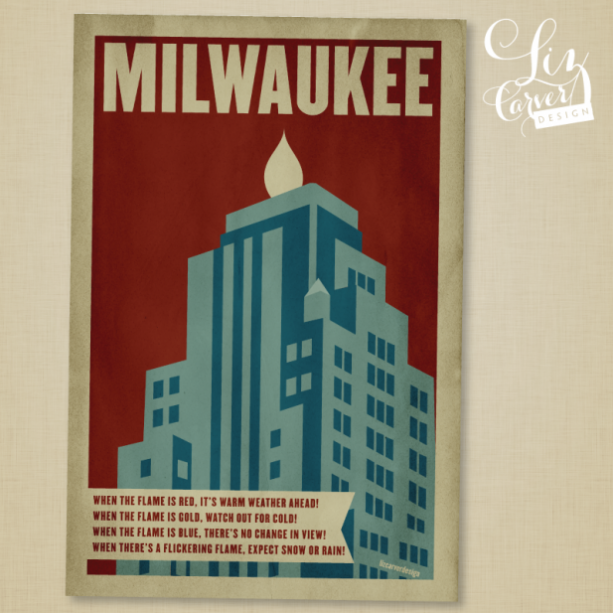 This print is perfect for anyone and everyone who loves Milwaukee, Wisconsin, Art Deco architecture, or history! Enjoy!!! D E T A I L S This print will be run on archival-quality stock. Final size is 11x17. Message us if you're interested in a different size, or for it to be run on canvas. F I N E P R I N T ÃÂ©2013 Liz Carver Design No part of this may be reproduced, distributed, performed, publicly displayed, or made into a derivative work without the permission of Liz Carver Design.